New Rochelle, NY, October 11, 2018–In follow-up to the I HART CGM study, which showed the benefit of real-time continuous glucose monitoring (RT-CGM) compared to flash monitoring for time spent in hypoglycemia among adults with type 1 diabetes at high hypoglycemia risk, researchers conducted an extension trial that assessed the effects of continuing RT-CGM or switching from flash to RT-CGM of the subsequent 8 weeks. 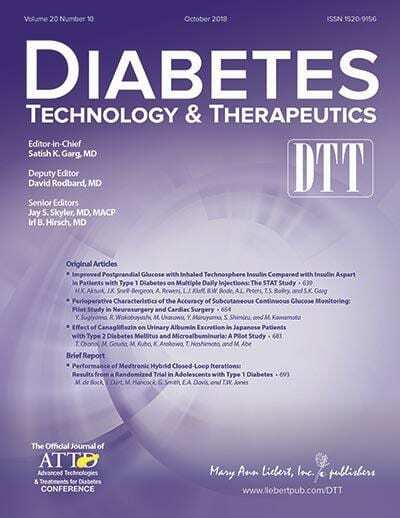 The study design and results are published in Diabetes Technology & Therapeutics (DTT), a peer-reviewed journal from Mary Ann Liebert, Inc., publishers. The full-text article is available free on the Diabetes Technology & Therapeutics (DTT) website at https://www.liebertpub.com/doi/10.1089/dia.2018.0252. Monika Reddy, Narvada Jugnee, Sinthuka Anantharaja, and Nick Oliver, Imperial College London, U.K. coauthored the study entitled "Switching from Flash Glucose Monitoring to Continuous Glucose Monitoring on Hypoglycemia in Adults with Type 1 Diabetes at High Hypoglycemia Risk: The Extension Phase of the I HART CGM Study." The researchers reported a significant reduction in time in hypoglycemia among the subjects switching from flash to RT-CGM. Subjects continuing with RT-CGM for the additional 8 weeks maintained the benefits of that option related to hypoglycemia. "Patients with a history of severe hypoglycemia associated with hypoglycemia unawareness would benefit from 'alarms and alerts,' and thus it makes sense that using a RT-CGM would show benefit in hypoglycemia reduction in this high risk population compared to using a device without alert features like flash glucose monitoring," says DTT Editor-in-Chief Satish Garg, MD, Professor of Medicine and Pediatrics at the University of Colorado Denver (Aurora).